They walked 1800 miles in 105 days, following Scott’s footsteps, and made it back to safety at Scott Base, Antarctica. And made history. The band of armchair explorers followed on the blog, Google Earth, and Twitter yesterday evening as Ben and Tarka walked the final miles. The online community was buzzing. I can only imagine what the reception was like at Scott Base. And their relief. And how overwhelming people and buildings and furniture and everything else must have seemed. 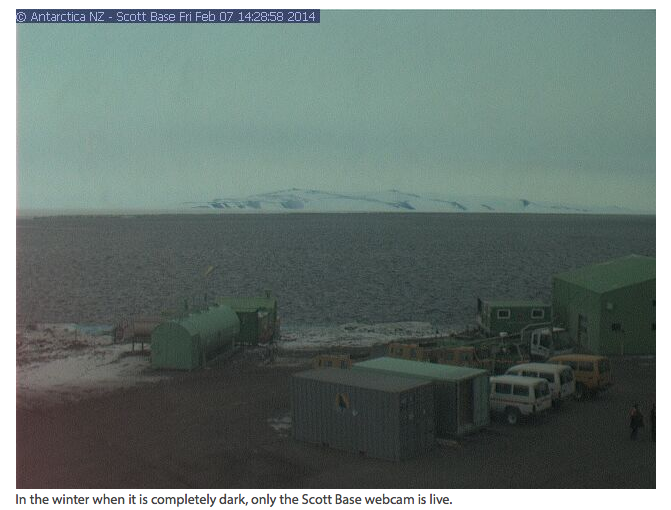 There’s a webcam at Scott Base, with a bleak view of some storage containers, vans, and the choppy ocean. Last night, some online followers were begging the expedition support team to ask Ben and Tarka to step out in front of the camera. At one point after their arrival, briefly, someone (or two) stepped into the lower right corner of the frame, and I took a screen capture. Was it B&T? I’ve no clue. But let’s just say it was. I don’t know exactly why I’m so obsessed with Scott’s story, but I just plain am. And thank you for bearing with me. I’ll wrap this all up by leaving you in the words of others: of the Irish poet Derek Mahon, who writes about the terrible last words and moments of Captain Lawrence Oates, who walked out into the white and never returned; of Herbert Ponting, expedition photographer, who survived; and of Edward Wilson, some say Scott’s closest friend, who perished with him in the tent, 11 miles short of One Ton depot. The others nod, pretending not to know. At the heart of the ridiculous, the sublime. He is just going outside and may be some time. Quietly, knowing it is time to go. Which was lost in a white fog-bow. With the bite of the drifting snow. I just discovered your blog! All because I’ve also been obsessed with Ben and Tarka’s expedition. I’m having withdrawals, as reading Ben’s daily entries was how I started each day at 4:30 AM while drinking my one cup of coffee with coconut milk. I’m sorry I didn’t “e-meet” you sooner. We could have worried about them together. =) I’ll anxiously await Ben’s TED Talk while recovering from my Scott Expedition addiction.